Syria Today: How Many Were Killed in Hatla? And Who Did It? Wednesday was marked by claims of the first “massacre” of Shias by Sunni fighters in the 27-month conflict. Reports, relying on the Syrian Observatory for Human Rights, asserted that 60 people had been slain in Hatla in Deir Ez Zor Province. The story of Hatla is far more complicated than this simple framing. Indeed, the story has yet to be established. First, the casualties. The figure of “60” dead appears to have no more evidence at this point than its assertion by the SOHR. Videos from Hatla show bodies, but it is unclear how many there are and indeed if those shown are all those slain or only some of the victims. Nor is it evident if the dead are all civilians or if — as some insurgents claimed — “shabiha”, pro-regime militia — in particular, militia responsible for the killing of four opposition fighters on Monday. Second, the attackers. SOHR claim that “thousands” of insurgents took part in the killings, but does not give any evidence or source to back up this grand assertion. In footage purportedly from before the killings, a group of armed men, some wearing Islamist headbands — certainly not thousands-strong — vow to attack Shias and shout slurs against Shias. However, the affiliation of the men is not established — are they members of an organised insurgent brigade, a splinter faction, or are they just a group from the area looking for violence or retribution? A number of videos showing Islamist fighters in Hatla have been uploaded to YouTube (some of the videos have now been taken down as they violate YouTube’s hate speech policy). Reports about this footage have added to the confusion over the events in Hatla. The Associated Press — whose source is apparently the UK-based Syrian Observatory for Human Rights — reports that one video, which it does not show, has footage of a Sunni Islamist accusing Kuwaiti Shias of funding the Shia fighters in the village. CBS, meanwhile — again with the Syrian Observatory as its source — claims that Sunni Kuwaitis carried out the killings. The footage CBS uses to back up this assertion has now been removed from YouTube. The involvement of Kuwaitis in the attacks does have circumstantial support in other footage showing a prominent Kuwaiti activist praising the attack. Syrian State media offered an entirely different explanation for the killings. SANA blamed the killings on Islamist insurgent faction Jabhat al-Nusra, and made no reference to Shia fighters being the targets of the violence. Instead, SANA reported that 30 villagers, including women and children, had been killed by Islamist “terrorists” because they refused to support the group. SANA also claimed that the killers had looted the houses, bodies and places of worship of the victims. Journalist Hassan Hassan offers the fullest explanation so far, using an interview with a Free Syrian Army spokeman, Omar Abu Lilah. This suggests a co-ordinated reprisal operation by insurgent brigades after Monday’s killing of four opposition fighters at a key checkpoint near Deir Ez Zor city. 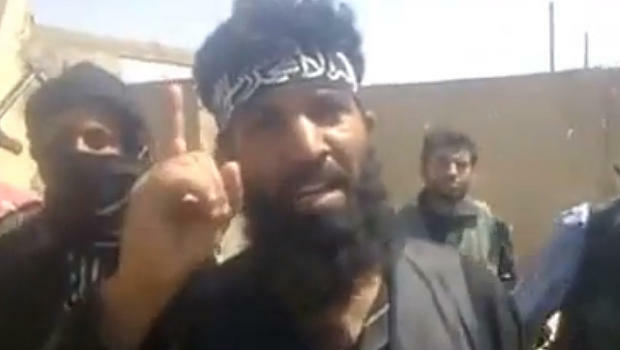 Abu Lilah said those who were killed were not civilians but armed men who had attacked FSA fighters and killed some…. He said the Shia fighters worked in a group called the National Army, formed by an officer from Mo-Hassan city in Deir Ez Zor. This group, according to Abu Lilah, seeks to stoke tensions in the area by spreading news that Shia fighters from Iraq and Lebanon are in the province. The FSA then decided to raid village and capture the fighters – he said the number of fighters wanted by the FSA is over 265, a “large number of them have been killed”. He said a few of the fighters have been captured by the opposition fighters and are being investigated about the National Army and other information. However, the video from Hatla suggests that the attacks may have gone beyond reprisals against regime fighters, with an Islamist insurgent claiming that Kuwaiti Shia were behind the conversion of the village and calling on Kuwaiti Sunni to exterminate all Shia in Kuwait. Whatever the “truth” in Hatla — and that may never be established — the incident points to one conclusion. With the escalation of this conflict — the fragmentation beyond a single “insurgency” into a myriad of groups, foreign involvement on both sides, and the continued pursuit of the conflict by the Assad regime — this is likely to produce more Hatlas in a conflict without resolution. Homes in Homs old city destroyed by aerial bombardment. The video caption says of the family living in the house that the father and mother were killed and the children injured. At 2:18, the missile that hit the house is shown. At 2:43 a child is helped from the rubble. Israel’s Deputy Foreign Minister, Zeev Elkin, said in Moscow on Thursday that Israel is very concerned about the prospect of Russia supplying S-300 surface-to-air missiles to Syria, saying that was “unknown into whose hands [the weapons] would pass”. Elkin also said that Israel would consider attending the Geneva 2 conference if invited. “But I do not know how Israel could assist the process. We do not have a working relationship with either of the parties to the conflict, so I do not think it makes any sense [for Israel to attend],” he said according to RT. Elkin also expressed doubt that the conference would take place and what results it could bring, RT reported. Transport Minister Mahmoud Said has dismissed as exaggerated news reports of a missile attack targeting an Iraqi aircraft at Damascus International Airport on Thursday, State media is reporting. Several Arabic outlets, citing Russia Today’s Arabic service, reported earlier on Thursday that insurgents fired rocket-propelled grenades at the aircraft, which resulted in a number of passengers being injured. Said reiterated earlier comments that insurgents had fired two mortar shells at the airport. The minister said that one of the mortar shells had hit the edge of the airport near the runway, delaying the landing of two flights from Latakia (in northwestern Syria) and Kuwait. The airplanes landed without problems some minutes later, Said added. Another Syrian flight, destined for Baghdad, was delayed for about 30 minutes in take-off due to the shelling. Said said no passengers were hurt.A second mortar shell hit an airport warehouse, injuring several workers lightly. Airport workers were “used to working in such conditions and gave uninterrupted service”, he added. The death toll in Syria since the start of the conflict is at least 93,000, according to a report published Thursday by the United Nations. At least 5,000 people have been killed wach month in Syria since last July, according to the report. However the UN say that these figures are likely higher as many deaths have simply not been reported. Footage of Islamist insurgents “combing the village of Hafla after its cleansing of Shia militias”. The video was posted by an activist named “kuwaitywithsyrianrev” and was purportedly taken on June 11, the day of the reported mass killing. The streets of the village appear to be deserted. At one point, the insurgents enter an area they say contains “shabiha houses”. There are sounds of sporadic gunfire. At least one of the insurgents waves what appears to be an Islamic State of Iraq flag, including at the end of the footage, when an insurgent is shown waving the flag from the roof of a “Shabiha house”. No bodies of those killed are shown in this footage. Note to readers: It is unclear where the insurgents in this video are from — if anyone has any idea of their accents/ dialect, we would be interested to know. This 15-second video,posted Thursday by activists from Deir az-Zur, shows an Islamist insurgent purportedly during the “cleansing of Shia militias” from Hatla. The insurgent points to the words “Ya Ali” — a phrase used by Shias — on the wall, and threatens to cleanse Shias from Lebanon to Deir az-Zur. The General Command of the Syrian military has admitted firing three missiles into Arsal in northern Lebanon on Wednesday, saying it “targeted a terrorist group trying to escape to the Lebanese territories”. The military said “it is committed to respecting the sovereignty of the Lebanese Republic and its people’s security”. The Local Coordination Committees claim that 70 people were killed on Wednesday, including 20 in Damascus and its suburbs, 14 in Aleppo Province, and 12 in Homs Province. The Violations Documentations Center records 63,471 deaths since the start of the conflict in March 2011, an increase of 78 from Wednesday. Of the dead, 48,919 are civilians, a rise of 51 from yesterday. The United Nations has criticised both Syrian troops and insurgents for recruiting children to fight, and it has claimed that some have been tortured by regime forces for links to the opposition. The UN report, issued after UN envoy Leila Zerrougui visited Syria in December, said thousands of children have been killed in the violence, “while thousands more have seen family members killed or injured”. Insurgent groups, including the Free Syrian Army, were also accused of using children, generally aged 15 to 17, in combat and in support roles, such as ferrying food and water and loading cartridges,. “From accounts received, child association with the Free Syrian Army is often linked to an older relative facilitating recruitment or in instances in which the child has lost all members of his or her family,” the report found. PreviousIran Today: Can the Moderates and Reformists Win the Election?